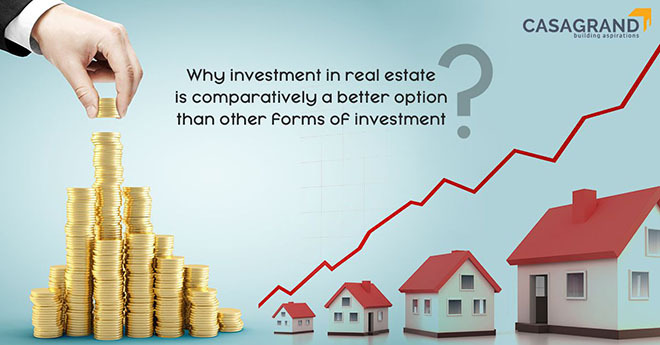 Why Investment in real estate is comparatively best option? The Indian real estate market is expected to touch US$ 180 billion by 2020. Indian Realty market size is expected to increase at a (CAGR) of 11.2 per cent. Retail, hospitality and commercial real estate are also growing significantly, providing the much-needed infrastructure for India’s growing needs. The Indian real estate market is becoming a hot selling property and is attracting the attention of investors as they are getting huge profits and high returns on their investments. The real estate in India earlier was an unorganised industry with high transaction costs and an absence of complete transparency, but RERA and GST’s impact has brought transparency among builders and investors. In August 2015, Govt of India approved 100 Smart City Projects in India. It also raised FDI limits for townships and settlements development projects to 100 per cent. Real estate projects within the Special Economic Zone (SEZ) are also permitted 100 per cent FDI. In Union Budget 2015-16, the government allocated US$ 3.72 billion for housing and urban development. The private equity investments in real estate increased 26 per cent to a nine year high of nearly US$ 6.01 billion in 2016. Seeing this current trend one can say that India is going in a right direction and soon more and more people will be coming forward to go for real estate investment property in India. India is a country that offers a suitable environment providing maximum benefits to the investors. With banks offering lower interest rates for home buyers. This will be the right time to invest in real estate and reap the rewards in mere future. Apart from these factors, the RERA bill and the newly-introduced GST reforms have made investing in real estate even more beneficial. If you are planning to buy a new home, make sure you go through our detailed guide of taxes and duties payable for a hassle-free experience. Head out to Casagrand today and make the investment of a lifetime.